Our communications agency produced a report for a colloquium on "Using renewable energies to help humanity: current situation and perspectives for 2030 and 2050". 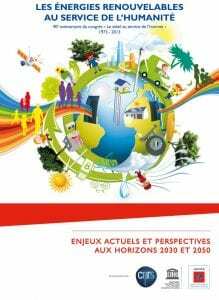 Our communications agency produced a report for the colloquium on "Using renewable energies to help humanity: current situation and perspectives for 2030 and 2050" (picture opposite) for ADEME International, UNESCO and the CNRS. Desjeux Créations, did the graphic design, illustrations (cover: Gérard Berthelot), and editorial work for these two 140-page brochures in French and English. This report summarises an event organised by ADEME International, UNESCO and the CNRS to celebrate the 40th anniversary of renewable energies. "This colloquium (15 September 2013) was a chance to look back at the unprecedented industrial and economic changes in renewable energies and present their prospective growth between now and 2050, with the aim of providing universal access to energy and offering solutions for climate issues". The whole communications project was devised and managed in Les Alleuds, near Angers by our team of communications, graphic design and multilingual layout experts, working closely with ADEME International. Our team spent 3 months working on these two brochures, in French and English (hard version and digital version for the web), for an overall budget of €20,000. Share the post "Ademe international"